You might recall, not so many years ago, nobody was asking for 100 per cent renewable electricity, or even thinking about it or imagining it might be possible. So what happened? One evening a group of climate campaigners were sitting around a kitchen table trying to devise strategies for reducing carbon emissions. One person had a wild idea and wondered aloud if it would be possible to switch to 100 per cent renewable electricity (or so I’m told – I wasn’t there). How could we do that? Would that be possible? Reliable? How much would it cost? 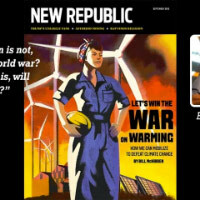 Beyond Zero Emissions then set about researching those questions, and a year or so later published the 100% Renewable Stationary Energy Plan. They showed it could be done, how to do it, how long it would take, and what it would cost. Suddenly we all knew 100 per cent renewable electricity is perfectly possible, and we could all imagine achieving just that. Almost overnight, we started believing it was a possible future and campaigning to get it. Since then other studies have confirmed and updated BZE’s basic message. These days almost any conversation about climate includes mention of 100 per cent renewable electricity. It’s a familiar part of the public discourse. It appears in petitions, submissions, interviews, and media. It’s treated as a standard and fully legitimate campaign ask. What’s more, almost everyone can imagine it happening, and almost everyone except the fossil fuel incumbents want it to happen sooner or later. It’s become a no-brainer. Right now the Climate Emergency Declaration and Mobilisation campaign is just a few months past the wild idea round the kitchen table stage. Very few people have thought of it or heard of it, and very few are yet imagining it is a possible future. How do we get from this point to the same sort of no-brainer point that the 100 per cent renewable electricity campaign now enjoys? We’ve done a few things already. The first thing was the petition. Asking someone to sign a petition is a good way of making the signer aware that this new campaign ask exists. We’ve also collected quite a few eminent person endorsements, which helps tell the world that this is not just a wild idea. We’ve been trying to paint a picture of what a climate emergency declaration and mobilisation might look like, and what it might achieve. 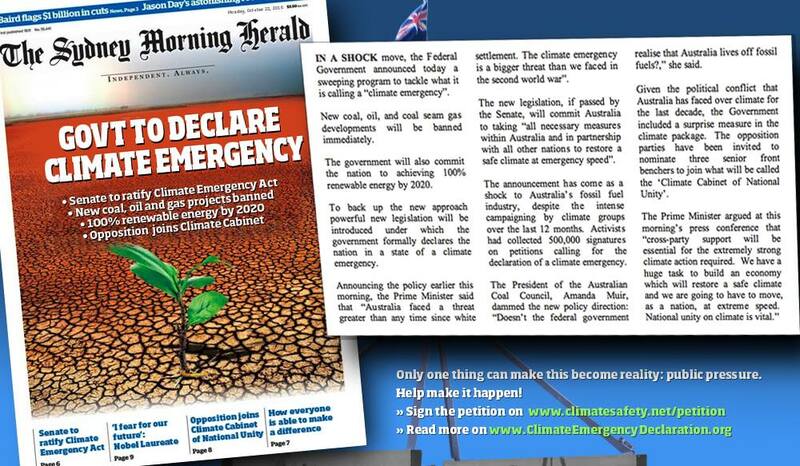 We posted a hypothetical Sydney Morning Herald front page and article in which the Prime Minister of the day announced such a declaration and discussed a couple of first climate mobilisation measures. 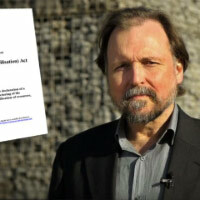 Philip Sutton has written a draft of the sort of legislation that would need to be enacted in order for Parliament to declare a climate emergency. We’ve been posting social media memes indicating that many of the current climate-related campaigns, like stopping Adani, banning CSG, stopping drilling in the Bight, protecting native forests, closing Hazelwood, etc., would be won almost automatically if this top level climate mobilisation ask is won. The Sustainable Hour on 94.7 The Pulse in Geelong has been podcasting a series of interviews with policy makers and leaders about the challenges and the solutions. Clearly there is more work to do though to make the Climate Emergency Declaration and Mobilisation campaign into a familiar no-brainer. But we think we have a powerful tale to tell. 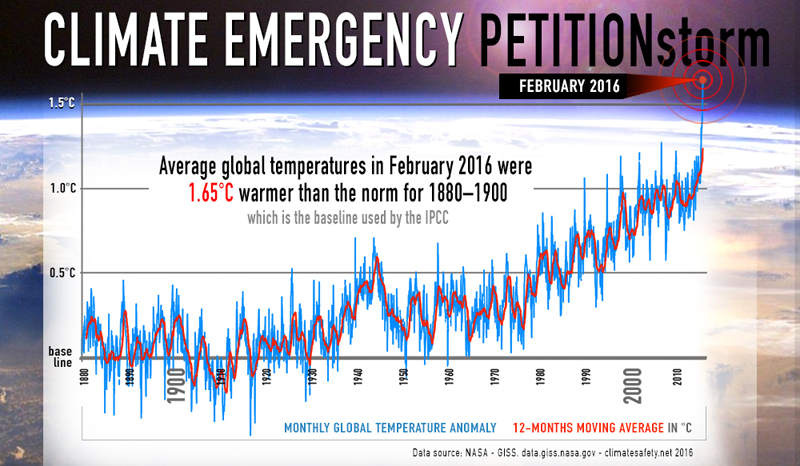 Global average temperature spiked at over 1.5°C in February, and already another 0.5°C is locked in once we stop burning fossil fuels unless we take additional actions to counteract that. Already people are dying from heat stroke and starvation, drowning in floods, and running out of water. Ecosystems are being damaged, and inhabited land is being lost to sea-level rise. Doing anything less than going ‘beyond zero emissions’ as rapidly as humanly possible is now morally inexcusable. History has shown us how amazingly quickly economies can be restructured when society faces an existential threat. During World War II, factories were repurposed, large slabs of the GDP were spent on the war effort, and the public by and large rose to the occasion and did what was deemed necessary. The best minds from all sides of politics worked together for the common good. 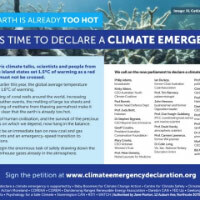 A climate emergency declaration would be a powerful signal saying that society as a whole is now entering ‘emergency mode’ and will give highest priority to reaching net zero emissions as quickly as possible. Emergency mode would continue until we are clearly heading in the right direction for a safe and cooler climate. 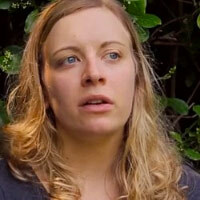 A first mobilisation step might be to ban all new fossil fuel projects and ban logging of native forests. Those could be achieved with the stroke of a pen. Fossil fuel subsidies could be redirected to help establish an electric vehicle industry. Coal and gas exports could be replaced by exporting solar generation to Asia via an undersea cable. Renewable electricity and energy efficiency measures could be rolled-out extremely rapidly following a well-considered best scenario of what to do where. We already know what to do! This would create large numbers of jobs for those no longer employed in fossil fuel industries and others. As in World War II, it’s likely we’d again enjoy full employment. So, what should we do next to help society as whole imagine this possible future? Once we imagine it we can demand it. If enough people from a broad enough cross-section of society demand it, the government could declare a climate emergency tomorrow and start throwing our considerable resources at the goal of protecting all people, species, and ecosystems. This entry was posted in news and tagged Australia, strategy. Bookmark the permalink.